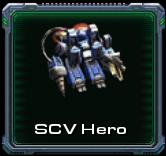 Allow the SCV hero to repair nearby mechanical allies. THe repair rate increases with the hero's level. Increases the damage output and durability of the SCV hero for 8 seconds. Allows the SCV to construct Shredders. Shredders are structures that can emit a radiation field, damaging enemy units in a range of 5. Radiation fields from multiple shredders stack. Shredders do 8 (+0.8/lvl) damage and scale with Hero's stats. Level 1: Maximum of 4 Shredders. Level 2: Maximum of 6 Shredders. Level 3: Maximum of 8 Shredders. Allows the SCV to use Overclock. Increases the speed of allied units attacks and cooldowns for 10 seconds while increasing damage taken by 30%. Level 1: +30% attack speed and cooldown reduction. Level 2: +40% attack speed and cooldown reduction. Level 3: +50% attack speed and cooldown reduction. Allows the SCV to construct battlecruisers. The life and damage of battlecruisers scale with the hero's level. Battlecruisers take 5 seconds to construct. Level 1: Maximum of 2 battlecruisers at any given time. Level 2: Maximum of 3 battlecruisers at any given time. Level 1: After a 3 second channel time, Yamato cannon blasts a target with a devastating plasma cannon, causing 80 (+8/lvl) damage to target enemy unit. -Teleporter replaced with radar tower. Radar towers have an active that permanently grants vision of a target area with a radius of 10. Cloaked units are indicated but not revealed. Each radar tower can scan 1 area at a time. Cooldown: 15. Cast range: 15. Can control up to 0/0/3 radar towers. -Battlecruiser Teleport now has a cast range of 50.